Please call for more info on age groupings as they vary according to time slots. Please note that classes on a Wednesday is only for age groups 4-6. Classes on Saturday afternoon is for age groups 12-15. 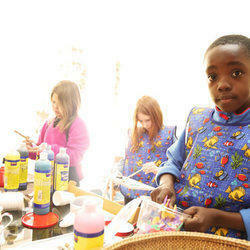 Artistry is an art studio in a peaceful garden setting in Greenside, Johannesburg. 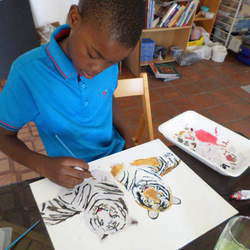 Using various materials and techniques, Artistry aims to develop individual artistic interests and style in a fun and relaxed environment. Margalete Rubinstein is a Michaelis School of Fine Art graduate with a specialisation in art education. Of the 27 years that she has been teaching, she has spent the last 5 of them teaching in a Small Class Inclusion Programme which accommodated and assisted children with specific learning challenges. She is a strong believer in the creation process being of the greatest importance, not the final product. "Margalete has been such a wonderful find! 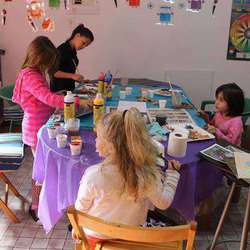 Our daughter has been attending art classes for the past year with Margalete and she just loves it! She looks forward to every Thursday and often says it's her favourite day of the week because it's "Margalete Day".